For a brief background on Sonic the Hedgehog, check out the post here. After the success of the Sonic the Hedgehog video game and its sequel, Sega decided to bring the franchise to television to further expand the brand and attempt dominance over rival Nintendo and their mascot, Mario. Teaming up with DiC Entertainment (who also produced Nintendo’s various Mario cartoons, a couple of which will be discussed here in time), the companies released not one, but TWO animated series based on Sonic. Originally pitched to and rejected by ABC, The Adventures of Sonic the Hedgehog became a syndicated weekday program which saw Sonic (Jaleel White, who had risen to fame as Steve Urkel on Family Matters) and his partner, the two-tailed flying fox Miles “Tails” Prower (Christopher Welch) from Sonic 2, constantly fight to foil Dr. Robotnik’s (Long John Baldry) schemes to take over the zany world of planet Mobius. The character designs were more exaggerated than the video game counterparts and the show was played for humor. It ran for a single season of 65 episodes plus a Christmas special. However, over on Saturday mornings, things on planet Mobius in the 33rd Century weren’t quite as cheery. 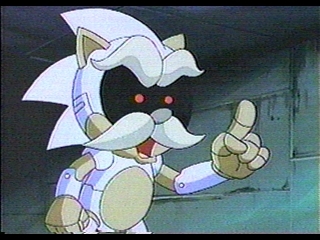 Created by Len Janson in response to ABC’s passing of Adventures and simply titled Sonic the Hedgehog (affectionately dubbed Sonic SatAM by fans to distinguish it from the other show), the series focused on the battle against Dr. Julian Robotnik (Jim Cummings) in a much darker setting. 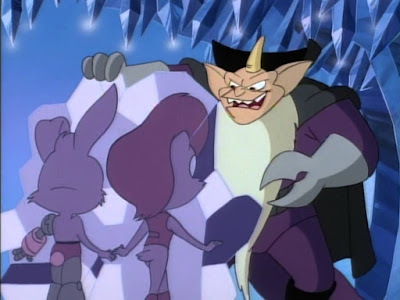 Having conquered Mobius by overthrowing King Maximillian Acorn (Tim Curry), Robotnik sought to remove all natural elements from the planet from his home base of Robotropolis (formerly Mobotropolis)--an industrial city populated by his various robots, including his personal army the SWATbots (voiced by various members of the cast). Cluck, an example of robotization. 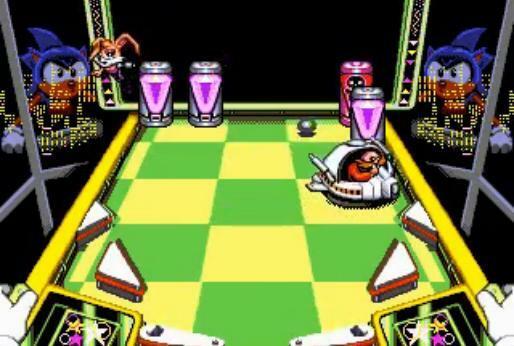 Robotnik had the ability to transform flesh and blood beings into robots with his roboticizer. The roboticizer was invented by Sonic’s uncle Sir Charles Hedgehog (William Windom) as a medical tool, but it had the unintended effect of turning creatures into robots without free will. Robotnik stole the device and Charles was the first to be transformed, driving Sonic into the fight against Robotnik. 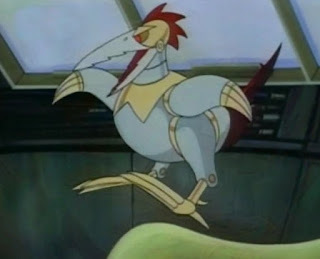 Aiding Robotnik was his diminutive nephew Snively (Charlie Adler), who suffered constant abuse from Robotnik, and a pet roboticized chicken named Cluck. An unused story element would have had Robotnik and Snively be time travelers who arrived from the past to find Mobius, which was actually Earth as it recovered from a nuclear holocaust (which is why they’re the only human characters). Freedom Fighters: Sonic, Sally, Bunnie, Tails, Antoine and Rotor. Sonic (also White, with his younger self portrayed by Tahj Mowry) and Tails (Bradley Pierce) were now members of an all-new group of fellow anthropomorphic animals known as the Freedom Fighters. 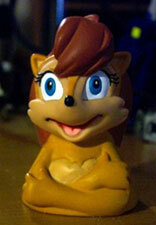 Joining them were Sally Acorn (Kath Soucie), Princess of Mobius, leader of the Freedom Fighters, and Sonic’s love interest who seeks to free her people and find her father; Nicole (also Soucie), a highly advanced A.I. housed in a portable computer Sally carries; Bunnie Rabbot (Christine Cavanaugh), a rabbit with a southern accent who was rescued from roboticization after half of her body was already transformed; Antoine Depardieu (Rob Paulsen), a French coyote who is clumsy, cowardly and arrogant; and Rotor (Mark Ballou & Cam Brainard), a walrus who serves as the Fighters’ mechanic and invents various gadgets. In a contrast to Robotropolis, the Freedom Fighters hang out in Knothole Village located in the Great Forest. The Power Rings that Sonic would collect for extra lives and vitality in his games were incorporated into the show as being able to give Sonic an extra burst of speed when held. They were magically formed at specific times from a pool near the village. New character Dulcy the Dragon. The series debuted on September 11, 1993 with a theme song by Noisy Neighbors called “Fastest Thing Alive.” After the first season, ABC asked for some changes to be made to the show to soften up its tone a bit. As a result, several episodes of the season were strictly humorous while the darker overall subplot and violence were dramatically toned down. Dulcy (Cree Summer), a clumsy, loud-mouthed dragon with super breath was added to the cast as both a source of comic relief and transportation for the Freedom Fighters. Robotnik’s voice was no longer digitally altered to be more menacing, and his intimidation factor was reduced by turning him into a more incompetent foe. Sonic’s egotism and childish antics, as well as Antoine’s clumsiness and cowardice, were increased and exaggerated. Concerns by parents over Sally’s more human-like appearance prompted the addition of a vest to not appear totally “naked.” Bunnie’s upper arm was no longer roboticized and Rotor received new coloring, as well as a reduced role in the series and a new voice actor as Ballou opted not to return for the second season. The creation of the Power Rings was also punched up to be visually flashier. Ixis Naugus puts Bunnie and Sally on ice. 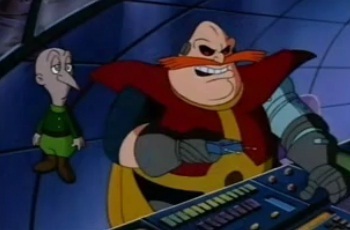 A third season was planned, which would have featured Snively as the primary villain after the fall of Robotnik alongside the evil wizard Ixis Naugus (Michael Bell), as well as further development for the characters and their interactions. However, the show was cancelled by the end of the second season due to declining ratings. Several factors went against the show at that time: it had been constantly pre-empted in the United States for other programming, it was competing against more popular shows like FOX’s Power Rangers franchise, and the new incoming president of ABC had no investment in the show to overlook the ratings and chance another season. Ben Hurst, one of the lead writers of the show with his partner Pat Allee, had lobbied unsuccessfully for many years after the cancellation to get the third season produced, or at least a movie incorporating those elements to close out the series in a satisfying manner. 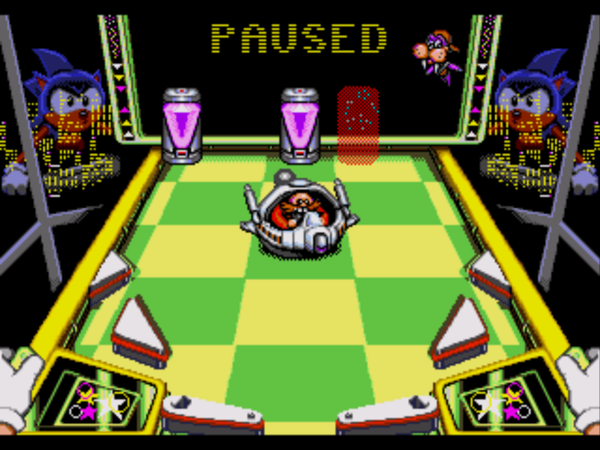 Sally, Rotor and Bunnie appear in Sonic Spinball. Before its cancellation, Sega had planned to incorporate elements from the show, such as its characters, into future Sonic video games. 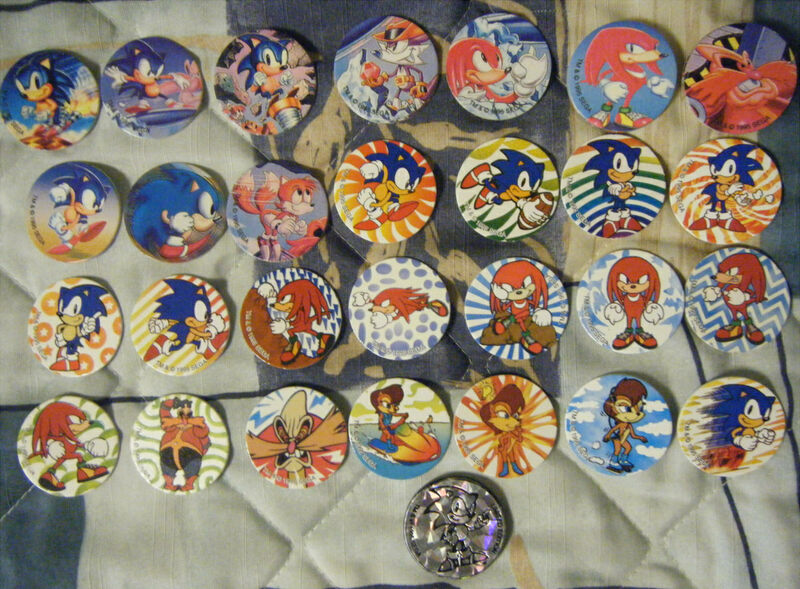 Only Sonic Spinball, which put Sonic in a pinball game-like setting, ended up using those characters. Sonic-16 and Sonic Mars were games in development that also would have included them, but both were ultimately cancelled. Princess Sally did make one last animated appearance, sans dialogue, in the aforementioned Christmas special. Sonic Play-A-Sound book, featuring Sally. SatAM was adapted into a series of books by Troll Communications and Golden Books, as well as part of Publications International’s Look & Find series. Only one of the Troll books, Friend or Foe?, adapted the episode “Game Guy” directly while the rest were original stories set in the same universe. 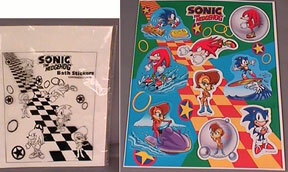 Sally was the only other character from the show heavily featured on merchandise (particularly on items from Australia), appearing on pogs, stickers, shampoo bottles, as a water bottle, various Sega World products, and as a bendable figurine, amongst others. 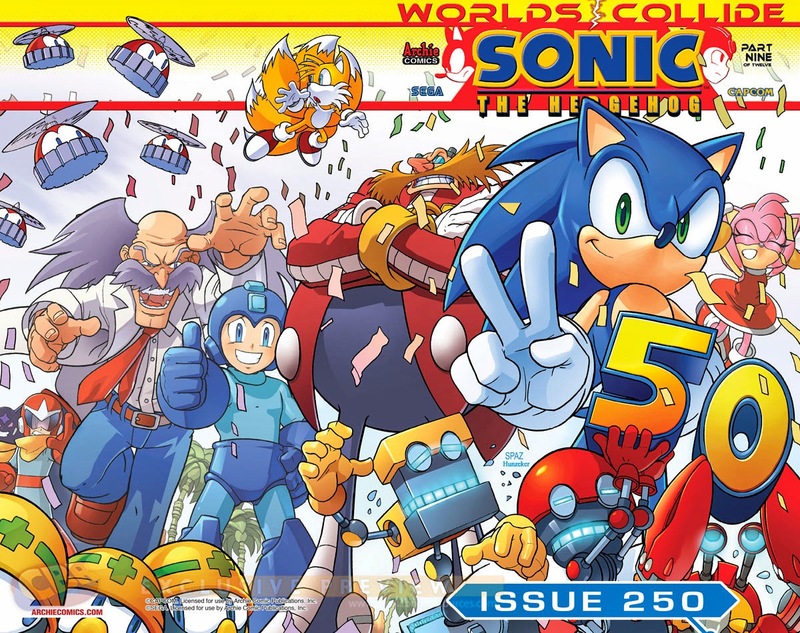 Sonic's 250th' issue by Archie Comics. The show’s premise and characters do live on in another form. In 1992, Archie Comics entered into a deal with Sega to make a comic based on the show. Because the comic and the show were being produced concurrently, the Archie team worked off of the series bible and character sheets which often led to differences in the content between the show and comic. 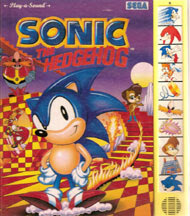 Originally debuting as a four-issue mini-series, Sonic the Hedgehog began the following year as an ongoing series. The comic initially featured a tone closer to that of Adventures and even used some of its characters, but after SatAM became evidently more popular the comic’s tone shifted towards more dramatic storytelling. Currently, the Sonic comic is the longest-running video-game based comic. Its success had led to several spin-off minis and ongoings with the wide array of characters created over the years. Not only does it tell its own narrative, but it also occasionally adapts the various Sonic video games in an alternate reality-type setting or as part of the main storyline. After the show’s initial run, it returned to TV in 1997 as part of USA Network’s Action Extreme Team programming block. Beginning in 1994, Buena Vista Home Video released a series of VHS tapes featuring two episodes each from the series. In 2007, Shout! 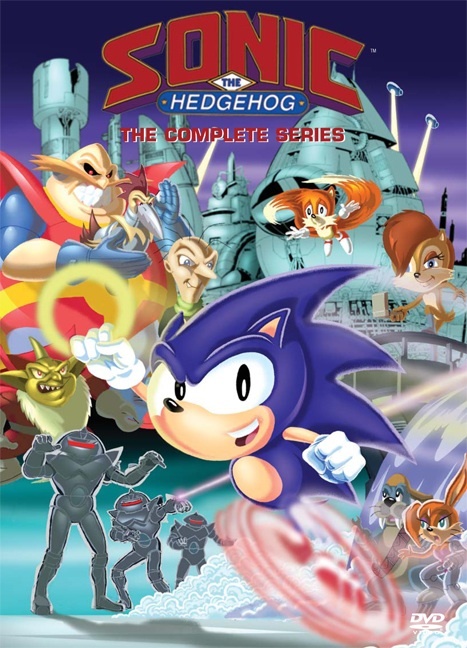 Factory released the complete series to DVD with additional special features, while Delta Home Entertainment released their own version in the UK (complete with a “SatAM Sonic” badge on the box). Delta also released several individual episode collections that year, while in 2008 NCircle Entertainment began doing the same in the United States (as well as releases from other Sonic cartoons). “Heads or Tails” (12/11/93) – Sally sends Sonic to Robotropolis for supplies for their defense system against Robotnik, neither knowing Tails has tagged along. “Sonic Boom” (9/18/93) – Sally investigates rumors of her father being alive. “Sonic and Sally” (9/25/93) – Robotnik captures Sally and creates a robot duplicate to spy on the Freedom Fighters. “Ultra Sonic” (10/2/93) – Sonic finds his long-lost uncle Sir Charles, roboticized by Robotnik. “Sonic and the Secret Scrolls” (10/9/93) – The Freedom Fighters search for magical scrolls that may hold unlimited power. “Super Sonic” (10/16/93) – Sonic loses his super speed while attempting to stop Robotnik from accessing an archive of evil spells. “Sonic Racer” (10/23/93) – Robotnik seeks to lure Sonic into a trap with a race, which the Freedom Fighters hope will keep Robotnik distracted long enough to kill the city’s power. “Hooked on Sonics” (10/30/93) – To impress Sally, Antoine goes after Robotnik alone. “Harmonic Sonic” (11/6/93) – Sonic and Rotor have to destroy Robotnik’s spy satellite before he discovers the location of Knothole Village. “Sonic’s Nightmare” (11/13/93) – Robotnik launches a world-destroying machine while Sonic is paralyzed by recurring nightmares about his personal fears. “Warp Sonic” (11/20/93) – An underground battle to defend Mobian refugees leads the Freedom Fighters to deal with their personal relationships. “Sub-Sonic” (11/27/93) – The Freedom Fighters search for magical water to restore the Great Forest, disappearing one by one along the way. “Sonic Past Cool” (12/4/93) – The Freedom Fighters must protect the last living herd of a dinosaur-like species from Robotnik’s clutches. “Game Guy” (9/17/94) – Sonic and Sally befriend a new Freedom Fighter, but he’s not entirely truthful with them. “Sonic Conversion” (9/10/94) – The Freedom Fighters’ de-roboticizer works and they fix Bunnie and Sir Charles, but things don’t go exactly as planned. “No Brainer” (9/24/94) – Sonic loses his memory and Snively tries to take advantage by turning him into a double agent. “Blast to the Past (Part 1)” (10/1/94) – The war going badly, Sonic and Sally decide to try and find the legendary time stones to travel back and stop Robotnik before he begins. “Blast to the Past (Part 2)” (10/8/94) – Sonic and Sally don’t go back far enough and must now save the Great Forest from being destroyed and their younger selves from being roboticized. “Fed Up With Antoine / Ghost Busted” (10/15/94) – Antoine is appointed the king of a cannibalistic biker gang. / Sonic and Tails investigate a haunting while camping. “Dulcy” (10/22/94) – Dulcy heads to the dragon mating ground when Robotnik sets his sights on roboticizing all the dragons. “The Void” (10/29/94) – Sonic and Nicole head into the Void to rescue Sally and Bunnie. “The Odd Couple / Ro-Becca” (11/5/94) – Duly accidentally destroys Sonic’s home, forcing him to move in with Antoine. / Antoine accidentally activates a robot that develops a crush on him. “Cry of the Wolf” (11/12/194) – The Freedom Fighters must work together with a new Royal Freedom Fighter group to take down an indestructible war machine. “Drood Henge” (11/19/94) – Sonic and Tails try to prevent Robotnik from getting the magical Deep Power Stones. “Spyhog” (11/26/94) – Robotnik comes close to discovering Sir Charles is spying on him, setting Antoine off to try and warn Charles. “The Doomsday Project” (12/3/94) – Robotnik sets his Doomsday Project in motion and the Freedom Fighters find themselves in a final stand against him. THE HISTORY OF SONIC THE HEDGEHOG. WHAT IS SATURDAY MORNINGS FOREVER?